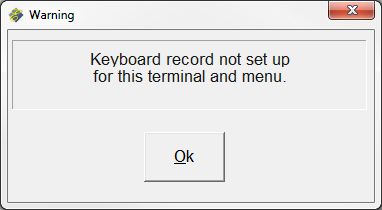 If you attempt to log into POS from a terminal number that hasn't been previously configured for the current company, you will see a message, "Keyboard record not set up for this terminal and menu." You can create a new keyboard record, or you can copy a keyboard record from another that's already working in the current company. Go to the POS Administrator menu and select Item Button (Keyboard) Set-up. Enter the terminal number of the terminal that's giving the error. Save by clicking the Save button at the bottom of the window. Click the Copy button at the bottom of the page. Enter the terminal number of a terminal that's working when asked for the Copy From Terminal. Press Enter to copy all menus. Click Yes to copy the menus.